Last week I went to hear Robert Montgomery speak at The Art Conference. I’ve been reaching out to him for a while now, trying to arrange a conversation, without luck, so I was excited to finally hear one of my favourite subvertising practitioners elaborate on his practice and related politics. There’s a very peculiar, effective force to Montgomery’s form of subvertising. This particularity resides in the way the poetic intervention leaps over the names and images of brands, to address consumerism as that field most requiring destabilisation. As such, and unlike culture jamming (thanks Jordan Seiler for this connection), it does not take the form of direct critique of the most despicable of companies, but instead, it expresses itself in the ethos of a more generalised questioning, one that addresses us not them. We are here not left hanging, dissatisfied, numbed by the perceived impossibility of change; instead we are shown how an imagined future utopian society starts from somewhere so close to us, something within reach, something we do at least feel in control over: our own being. The work thus empowers; it exhilarates as it angers. It points towards and is ultimately rooted within future potential. Therefore, it is always unfinished. As the theorist Raoul Vaneigem (1967, 201) pondered: ‘Why is it that the work of the greatest artists never seems to have an end? The answer is that great art cries out in every possible way for realisation, for the right to enter into lived experience.’ It is this lived experience, this call to ‘think of my bones as wood’, to exceed mediated and materialist experience, that is so central to the work of Montgomery. ‘The work of art of the future will be the construction of a passionate life’, Vaneigem went on. From this perspective, Robert Montgomery’s dream-like wordings are cries for a passionate life. They’re helping us to construct a novel collective consciousness, one that is so different to the one dominating our present era. And poetry, as Robert Montgomery shows us, has a particularly grand role to play in political projects. THE POETS WILL NOT REST UNTIL YOU TAKE YOUR LAND BACK AND YOU TAKE YOUR TIME BACK, Montgomery writes. Here the duality of critique (YOUR FEAR IS MANUFACTURED) and release (WE WILL WIN BECAUSE WE REMEMBER THE MAGIC INSIDE OF YOU) is again so beautifully married in his poetry. This is why his poetry works so well in inspiring movements such as Occupy London a few years ago, with the latter reaching out to the artist to ask if they can reproduce one of his billboards to inspire those involved in the struggle. This moment, as the artist recollected during his talk, was dozen times more important than any gallery or biennale invitations. But Vaneigem also notes, ‘[poetry] plays muse to rioters, informs revolt and animates all great revolutionary carnivals for a while’ only until ‘the bureaucrats consign it to the prison of hagiography.’ (Vaneigem 1967, 203) Montgomery’s greatest strength is simultaneously its greatest ‘weakness’: the ambiguity which allows it to speak so profoundly and so widely, is also that which allows for such easy co-optation. But what happens when his work starts appearing legally in the spaces of outdoor advertising companies, as it previously has? The performance of the work is, of course, fundamentally altered: it is no longer executed under a general state of precarity affected by the ongoing possibility of arrest. It has become more an object and less a performance. What happens in the encounter, and the way it diverges from illicit interventions, is harder to conceptualise. His work never truly appears as non-advertising at first sight; the typography forms and narrow spacing are fashionable, the white-on-black aesthetic equally. People walk past it like any other advert desperately screaming for their eyes, hearts and social connections. It is only at the moment of cognitive interpretation, of standing in front of the poster and taking it in consciously, that its subversive character emerges, sometimes at the end of the very first sentence – HERE COMES THE BOOM OF THE END OF YOUR CIVILISATION AND DON’T YOU LOOK PRETTY IN YOUR COOL NEW JEANS – and other times there’s a suspension, an uncomfortable holding mid-air of any sense of clarity, that is only resolved at the end: BLANK YOUR MIND WITH LIGHTNING FIRE AND BLOOD AND PUSH AWAY ALL THIS. Whether installed legally or illegally, since the passer-by is unaware of this distinction, the quality of the interventions remains the same. In that sense, Robert Montgomery’s work, for me at least (and there is danger here in me unavoidably presuming certain intentions on the artist’s end), could go further in following Raoul Vaneigem, one of the key theorists of the group that has been of great inspiration to Robert Montgomery (as he himself notes): the situationist international. While Robert Montgomery is happy to collaborate with Jack Agency, Clear Channel and other outdoor advertising providers, Raoul Vaneigem sees co-optation as the end of poetry’s fertility, a force that requires ongoing resistance. ‘Only an art armed against itself, against its own weaker side – its most aesthetic side – has any hope of evading co-optation’ (202). What’s more, the old specialisation of art somehow remains in his work: the galleries, the beautifully-printed monograph, the brand partnerships, the biennales. This is less a critique of his work (we have to make a living) than a gentle challenge and a call for reflection I am sending out to those negotiating the field of outdoor advertising spaces. In Montgomery’s vein of combining critique with hope, it may also be that collaborations push others, as a counter-movement, in new directions, perhaps mapping tighter, more radical connections between art, political ideology and social movements, ones which are premised not just on democratic messaging, but equally on democratic processes, on developing a ‘true poetry-made-by-all’. (201) The process may well become as empowering as the artful object itself, giving rise to the democratisation of art as much as that of public space. Reference: Vaneigem, R. (2006/1967) The Revolution of Everyday Life. London: Rebel Press. It’s 72 hours before the official launch of COP21 and 60 volunteers – armed with four-way utility keys and 600 six-sheet posters – drift across the streets of Paris in screen-printed JC Decaux vests. Their mission: to illegally replace existing advertisements with artworks that raise concerns around the sponsorship of COP21 by large corporations such as Engie (previously GDF Suez), BMW, Dow Chemicals, The Coca-Cola Company and Air France. “Tackling climate change? Of course not, we’re an airline,” reads one such illicit poster. At first glance, it looks surprisingly legitimate. The poster is signed off “Air France – part of the problem”. This is just one of 600 posters installed as part of the Brandalism project. A recent report by Observatoire Des Multinationales has revealed that only one of the ten major COP21 sponsors is lowering its carbon emissions in line with EU targets. Brandalism questions whether the public should trust that large-scale corporations and their market-driven tendencies will effectively respond to the current climate situation. Another report by the Corporate Europe Observatory emphasises how the Solutions COP21 exhibition (running alongside the talks) facilitates corporate “greenwashing” opportunities. The report suggests the event does this by allowing corporations to ride “on the coat tails of the real solutions” offered by innovative, smaller institutions to distract from the actual impacts of their core activities. Some of the Brandalism interventions re-appropriate the joyful aesthetics of the branding of that event to question its legitimacy. 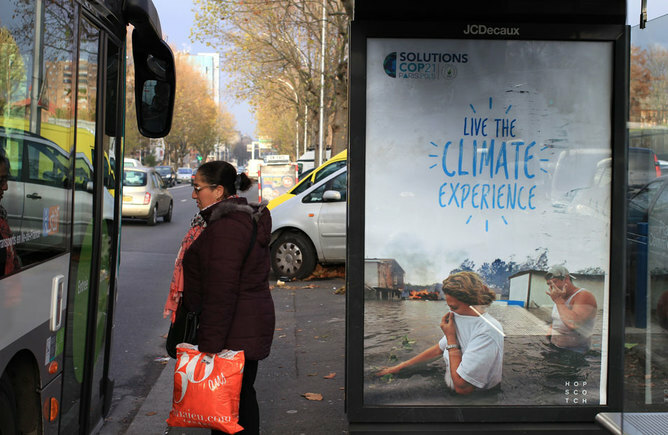 The Solutions21 tagline: “Live The Climate Experience” suddenly acquires a dark undertone when aligned with an image of a man and a woman traversing a flooded landscape against the backdrop of a burning oil rig. The question raised is clear: will COP21 prompt legally binding steps towards reconfiguring the unsustainable core activities of major companies? Or will it instead become an opportunity to paint businesses in a positive light of environmental friendliness? The cultural jamming practice of “subvertising” – a portmanteau of “subvert” and “advertising” – is by no means a novel emergence. The history of hijacking advertising ranges back to the 1970s when the Australian BUGA.UP (Billboard-Utilising Graffitists Against Unhealthy Promotions) collective started responding to what they considered offensive tobacco advertising. Around the same time, the Billboard Liberation Front initiated subversions of any outdoor billboard they deemed inappropriate across San Francisco. Today, the practice of subvertising is reaching novel heights. Collectives are starting to connect globally to form an ever-increasing force of resistance against the visual and mental implications of advertising. Initiatives such as Brandalism, Brigade Antipub and Plane Stupid are beginning to specifically address the connections between advertising, fossil fuels and climate change. And Brandalism’s new “adverts” do not simply critique; they are, at times, also suggestive. Some of the posters present words and images that poetically reflect on modes of alternative living to suggest the more fundamental transformations in culture possible (and necessary) to circumvent environmental decline. 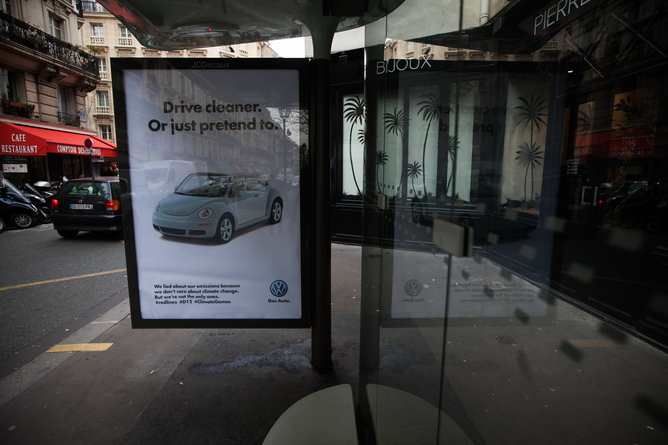 Subvertising is not just gaining relevance in the light of COP21. Initiatives such as the £6 “hackpacks” by Strike Magazine! – offering bus shelter takeover keys and a how-to guide for £6 – also highlight and trouble the role outdoor advertising plays in the commercialisation of public space and of the people and relations occupying it. The right to the city is currently disproportionately distributed, with advertising spaces in public space only available to those who can afford to pay for it. This is particularly significant in the current French context, where under the regime of the state of emergency following the attacks on November 13, authorities are restricting certain liberties of public expression. Which state of emergency? Art work by Eube. In the weeks leading up to COP21, squats thought to be hubs for environmental activism were raided by police without judicial oversight. And while public assemblies such as football games and Christmas markets are allowed to proceed, political protests have been banned. In this light, there seems to be a greater turn towards creative acts of civil disobedience that, as activist and Climate Games organiser John Jordan has noted, occupy “grey areas in the law” to continue to publicly voice concerns. Advertising takeovers and other forms of creative disobedience are argued to be some of the few means left to contest who is allowed to take a seat at the COP21 discussion table and who is allowed to maintain a public voice. On the streets and online we’ve received a high range of “thank you’s”, demands for how-to guides and requests for the posters in printable form. 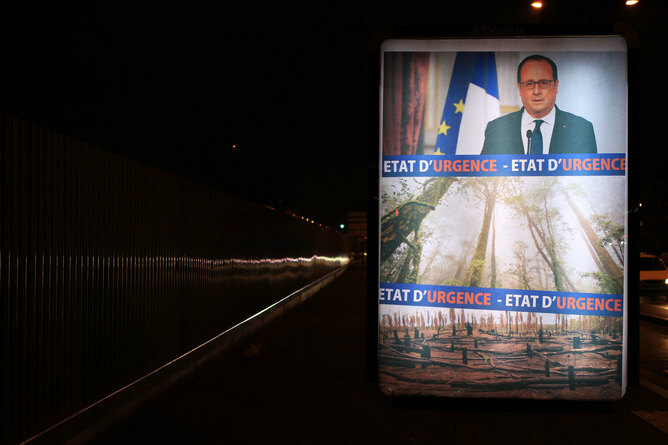 But now that the posters have all been removed (without further comment from police or JC Decaux), it still remains to be seen whether shedding a different light on the talks will affect COP21 at all. It costs an advertiser a few £10k’s to access bus shelter advertising spaces, it costs you £6. After their involvement with Banksy’s Dismaland exhibition, Strike Magazine! have been working to ensure public access to a third of the global outdoor media landscape; offering inhabitants the tools to claim their right to at least a part of the city. Their hack pack comes with a handy how-to guide. For Lefebvre (1991), the production and management of space is a dynamic central to the performance and manifestation of power. In the case of outdoor media, through private ownership, the advertising industry controls a significant channel of communication by turning it into a legalised marketable commodity set to work in favour of corporate flows, while working in a ‘public’ setting. Its re-appropriation by inhabitants then becomes, unavoidably, a claim to the right to the city. The idea of the right to the city, as intended by its progenitor Henri Lefebvre, has lost its radical edge through its appropriation by planning councils, urban regenerators and UN Charters (Purcell, 2013). It is simply becoming yet an other ‘right’ to be implemented into a liberal-democratic logic built upon the supremacy of ‘democratic control through elections, parties, laws, and stable state institutions’, rather than achieving its position as a serious contester of that same logic (Purcell, 2013: 142). For Lefebvre, taking ownership over urban spaces is merely a point of departure towards autogestion (self-management) with inhabitants taking on a more participatory role in the production of the spaces that they embodied and are embodied. Ultimately, the aims are to move towards a stateless society. So what then does this mean for offering access packs to the public? Even though, in granting a legally tenuous toolkit to operate outside of property laws and conventional party politics, the pack offers the potential to exceed institutionalised ideas of the right to the city, the question lies with the actual manifestations of the novel interactions with outdoor advertising it gives rise to. Indeed, what if artists re-embed these spaces with their own brands, their stylish logos, seeking attention from the commodified arts industry, where then do the politics of billboard distortion arrive? What kinds of worlds does it then open up to? Are we not, in this instance, devaluating any claims at seriously asserting our right to the city, in ‘branding’ it our own, once again, and following Michel Serres’ conception, polluting urban space like jungle-animals bounding their physical territories? We are here not far away from the paradoxical of endeavours of Russian urban explorers locking off their favourite roofs to turn them into exclusive (paying) tourist attractions. Or perhaps more obviously, what about artists collaborating with outdoor media providers (such as Brian Kane’s ‘Healing Tool’ project) or local councils? In the case of more (post-)anarchist appropriations, I believe the promise of the hack pack is in line with Lefebvre’s original, more radical conceptualisation of the right to the city. Here its intentions are not to achieve artistic fame, legal rights to media spaces (although a critique of property laws may be central) or even to abolish outdoor advertising from the streets. As Sao Paulo, Grenoble, Vermont and other cities have signalled, the social reappropriation or physical removal of media spaces do not, in themselves, formulate threats to the structural imperatives of consumer society (as if outdoor advertising is the sole maintainer of consumerism), let alone capitalist, state bureaucratic society as a whole. Instead, the role of accessing media spaces through hack packs should be a symbolic one: through the illicit subversion of some of the core machines of affect it hints at the potential for things to be radically different; where spaces and social relations are managed outside of economic imperatives. Advertising take-overs are here not ends in themselves, but rather leverage points for a novel participatory urban politics. The question is however how much longer activists will be able to leverage these arms. Now that conventional bus shelter spaces are increasingly replaced by their digital equivalents, will encrypted coding keys be sent across the web, providing access to the rhythmic veins of the capitalist body where they will be disentangled and re-entangled in forms more democratic than their original counter-parts? Or perhaps this is just a credulous dream. Purcell, M. (2013) Possible worlds: Henri Lefebvre and the right to the city. Journal of Urban Affairs, 36(1), 141-154.